Marty Grunder is a lot like many of you. He started his landscape business as a teenager with a used mower. His company’s top challenge is hiring and retaining employees. He’s a family man above all else. And he’s made some missteps along the way. What’s unique about Grunder, though, is his self-awareness and his willingness to learn, accept feedback and act on it, which can be tough for a successful, hardheaded entrepreneur. His growth mindset goes back to his childhood, he says. His mother, a teacher, and his father, a civil engineer, always wanted their kids to push themselves. 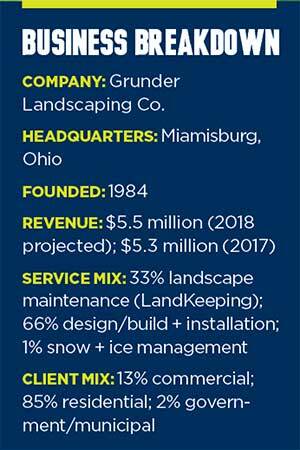 “They would never tell us no about anything related to work or making ourselves better,” Grunder says, which is how he came to use his father’s tractor to mow the neighbor’s yard for $10 and eventually start Grunder Landscaping Co. (GLC) in 1984. 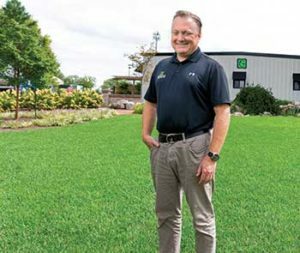 He tells the story of introducing himself in 1989 to landscape industry icon Frank Mariani, CEO of Mariani Landscape in Chicago—a gutsy move for a 21-year-old. Mariani has been his mentor ever since. Grunder is an avid reader of business books—he’s even written one himself—and he’s not ashamed to say he’s met with a counselor to sort things out after tough times in his life. He’s always focused on getting better. That’s why it’s no surprise that he seized an unexpected opportunity to improve his company when it presented itself in 2017 at GROW!, the annual conference he runs as part of his landscape industry consulting firm. That year’s conference drew about 300 attendees to Dayton, Ohio, and featured a tour of GLC and an auction to raise money for the National Association of Landscape Professionals’ Industry Growth Initiative. Up for auction were two-day sessions attendees could bid on to win a visit with Grunder or with so-called “industry giants,” including Mariani; Mike Rorie, board member of GroundSystems; Todd Pugh, CEO of Enviroscapes; and Jim McCutcheon, CEO of HighGrove Partners. Grunder was raised in Dayton, Ohio, on a gentleman’s farm with horses, a dog, an orchard, a lot of grass to cut and the equipment to do it with. 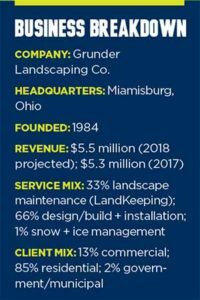 At age 16, he founded Grunder Landscaping Co. with his brother, Rich (who is no longer involved in the business), to fund his tuition at the University of Dayton. By his senior year at UD, the company grossed $400,000. Grunder was paying for school and had money in his savings account, but he also experienced uncertainty about his future, as he saw his business school buddies earning sign-on bonuses and buying suits and cars, while he wore grassy boots and drove a pickup truck. Always seeking counsel, he went to a local entrepreneur asking if he should get out of the landscape business. Though GLC had some early success, it hasn’t always been easy. In 2000, Grunder’s life changed when his father died unexpectedly. As a result, Grunder doubled down on his dreams and focused on being the father, husband and leader he wanted to be. To reach his goals, his business became more sophisticated, operating with budgets and adding processes. He became involved with Dayton-based Aileron, formerly known as the Center for Entrepreneurial Education. He attended the “Course for Presidents” there, among other training opportunities. Grunder also grew his consulting firm during the early 2000s and wrote a book, “The 9 Super Simple Steps to Entrepreneurial Success,” which is dedicated to his dad. Grunder learned another tough lesson in the mid-2000s when he decided to part ways with his cousin, a minority partner in Grunder Landscaping Co. It resulted in a lawsuit that lasted for two years. Grunder knows now he was in a predicament common among entrepreneurs—they fear upsetting one person rather than doing what’s best for everyone. He knew his partner wasn’t getting the job done for several years before he had the courage to let him go. Grunder calls that move one of the biggest turning points in his business. “Once we made that change, I was able to move people in the places they needed to be in,” he says. The company clipped along for more than a decade of steady growth. Being the biggest company was never a priority. Grunder is a proponent of the “small giants” concept—an idea he picked up from the book “Small Giants: Companies That Choose to Be Great Instead of Big” by Bo Burlingham. The pursuit of being the best is what convinced Grunder that Mariani’s crazy idea to bring the “industry giants” to GLC to offer feedback was more than worth doing. “If you can imagine Frank, Mike, Jim and Todd doing a tour of our operation, I couldn’t argue with them,” Grunder says, noting their companies combine for around $120 million in revenue and decades of experience. 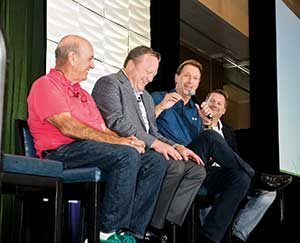 It was humbling and eye-opening to hear their advice, Grunder says. The feedback centered on his role in the business, the bottlenecks it created and how it was holding the company back. As he mulled over the suggestions with his longtime Vice President of Operations Paul Stoll and Seth Pflum, his then-production manager, he saw no logical reason not to make the recommended changes to the company’s structure to position it to scale up. Based on their advice, less than two weeks later, he promoted Pflum to general manager and instated a five-person leadership team. It includes Pflum at the helm as general manager; Stoll, now director of LandKeeping; Amber Fox, director of human resources; Michael Ericson, director of financial operations; and Dalton Yates, director of design/build. Pflum was a natural choice for general manager, Grunder says, noting he’s young, hungry and detail-oriented. He joined Grunder Landscaping Co. about six years ago after moving to Dayton from Indiana. The “industry giants” also unanimously thought Pflum was the right person for the job. It’s nine months into the new structure, and the reorganization is going well. It has allowed Grunder to focus on the company’s long-term strategy and do what he does best—networking, selling and overseeing the company culture. Pflum, who reports to Grunder and is now responsible for the company’s profit-and-loss performance, says the team already has accomplished a lot. They went from ground zero—devising a plan to roll out the changes to the team in January—to checking several major projects off their list. 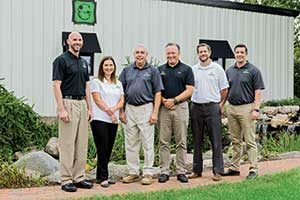 In addition to leadership changes, Grunder Landscaping Co. is working towards implementing a paperless office and is adding key staff, including an experienced horticulturist. Technology and process improvements have been a big focus. Today, the accounts receivable process is almost all digital, as are new hire packets and employee onboarding information. Accounts payable was at 10 days, and now it’s down to three. Long term—after the team eliminates duplicated efforts and is running efficiently in the new structure—the focus will turn to building a model that is scalable from a sales and production standpoint. Part of what’s making it a smooth transition is Grunder’s support and trust of the new leadership structure, Pflum says. If you stop by Grunder Landscaping Co. on a Tuesday at 8 a.m. and wonder why the trucks are still in the lot, it’s because the team is training. Like many landscape companies across the country, Grunder Landscaping Co.’s top challenge is finding and keeping good workers. Now that Grunder has moved into the chairman role, he calls “culture keeping” his primary responsibility. 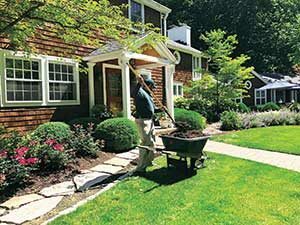 Increased training is just one way Grunder Landscaping Co. is enhancing company culture.